mama elephant | design blog: MAMA ELEPHANT ANNIVERSARY STAMPEDE - DAY 2! MAMA ELEPHANT ANNIVERSARY STAMPEDE - DAY 2! 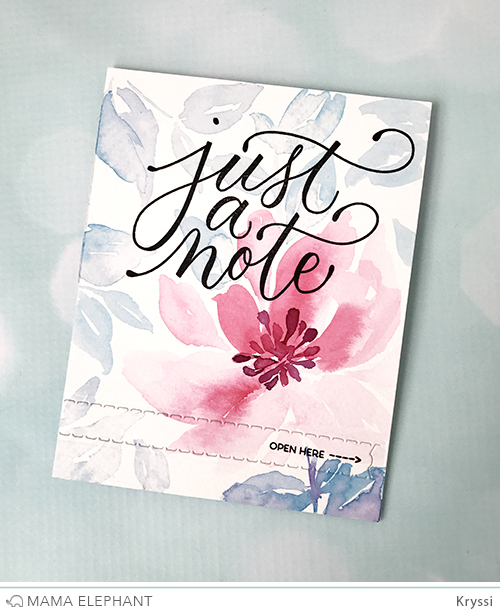 Spend min $100* - get a free 'Just a Note' 4x6 stamp set. 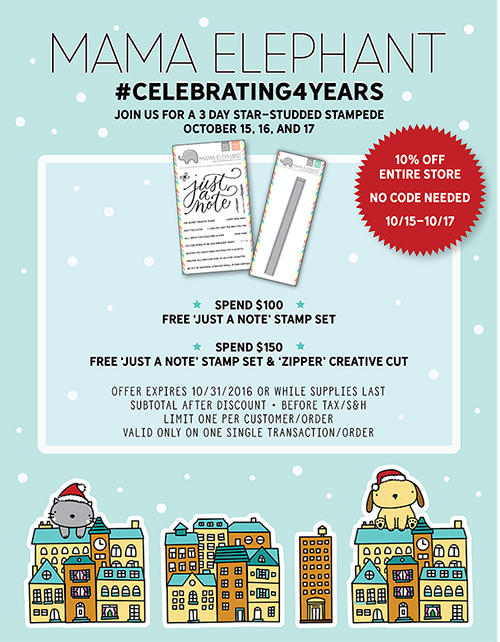 Spend min $150* - get a free 'Just a Note' 4x6 stamp set and 'Zipper' creative cut die. I was in the mood to watercolor for my card. I used my Gansai watercolors and hand-painted the flower and leaves loosely and stamped the Just a Note sentiment right on top when the surface was dry. Inside the card is a sweet little message using one of the companion sentiments hidden with the Zipper die. You'll have to tear it to reveal the secret message. I find this interactive feature so fun and sneaky! We hope you like it too! We have so many amazing guest designers joining for for this Stampede. It's a long list so we're breaking it up into 3 days so everyone gets some love. Beautiful card and I love the interaction strip! Love how simple but beautiful and thoughtful this card is. Gorgeous card - I love the idea of the hidden message behind the zipper die. I love the large font on this card.Its beautiful. Gorgeous! Beautiful font and the zipper die is so sweet. Perfect for any age, event or holiday. Lovely! Just purchased one of your sets!! Wow the watercoloring is just amazing! And the sentiment is the perfect size! Lovely card and a GREAT release. Congrats on your anniversary. Wow. Your hand painted flower is totally amazing! This is gorgeous! Your watercoloring is amazing! This is so pretty!! I love the large script sentiment. Wow Kyrissi the watercoloring is just outstanding! A work of art!! Loving the watercolour card! Hand painted! Sweet! Wow the love the gorgeous'just a note' sentiment! It looks awesome over this pretty watercolored card! Lovin the zipper die! What a lovely card! Another great release! So pretty! Love that sentiment and your watercolored florals!! Very pretty card and LOVE the zipper idea. Love it! Happy anniversary! Can't wait to see more designs and create my own using your stamps. Such a pretty card!! This new release is awesome!! Your casual hand painted flowers talent blows me away! What a pretty card! Happy anniversary, mama elephant! Love your stamps and dies! That is so soft and lovely! Love your gorgeous watercolored card! Beautiful design! Great job with the watercoloring. BEAUTIFUL watercoloring! Wish I could do that! Love Mama Elephants' large sentiments with all the little additions that come with them! On to the blog hop for some creative inspiration! Too fun! Thanks for doing this, I really enjoy it! Very pretty card, love the water coloring. Congrats mama elephant on your 4th anniversary !! That watercolor on this is STUNNING!!! Such a beautiful card. Happy Birthday!! What a soft and pretty card!! I love that zipper die! I love the zipper creative cut die. You showcased it so beautifully here. Thanks for sharing! I love those watercolor paints. I have so many ideas for that zipper die .... I'm going to be getting that one first! What a pretty floral and classy stamp! Love the beautiful colors on this card. Love this set. A beautiful card. The script is lovely and the watercolor is such a nice touch. Pretty card and fabulous watercolor. and fun that zipper is there! Really like the hop today! Love love your stamps. Another wonderful new collection! What a beautiful background on your card! Breathtaking! Thanks for the inspiration and for the opportunity to win! Stunning background and fabulous sentiment! Love the colors too, thanks for the inspiration and congrats again! This card is just breath taking. I love the soft colors of the flowers and the zipper pull. Those flowers are stunning! Love that great sentiment! You are certainly making me want to work on my watercoloring skills!! lovely card! Your watercolored background is just beautiful. I'm not sure I'd be able to pull the tear strip and ruin your card..
My nephew is 18 so he wouldn't quite get the Just A Note but he would love that tear strip because it's interactive. I would love to put that on a Christmas card for him! He's in college now, it's his first year so I know he would appreciate some cards. He wouldn't like flowers but I do and I love yours. You did some nice coloring. Congrats on 4 years of success. I hope you have many, many more years of success. What an amazing card!!! Love the part you have to tear away. Bravo!!! Gorgeous watercolor3d background! I'm a liker on facebook, follower on instgram and follower on twitter! I like your page in Facebook. I follow you on Instagram , I wish tohave some of your amazing realse. Your card is so very beautiful, you have a definite water coloring talent~! That loosely watercolored card is gorgeous. Love love the font of the sentiment. Amazing release, congrats on your anniversary! So pretty card! And the your hand painted flower is amazing. I already liked ME on Facebook and following on instagram. Love your products. And would love win this giveaway too. Love the card!!! Can't wait to get the stamps! Already made purchases on the first day of release. Just love them. Lovely watercolour card! Thanks for the inspiration in the blog hop. Thanks for the giveaway! I follow you on Facebook and Instragram! Adorable card!!! I love this kind of hidden messages! The card is just perfect....looks store bought! A beautiful card Kryssi- love the watercoloring & gorgeous stamp! So beautiful card! Love it! Beautiful card! The zipper die is a fun feature! Your blog inspires me to elevate my card making game! I recently started watercolouring and can't wait to start colouring your stamps! Wow, such beautiful, loose and elegant hand painted flowers. They pair perfectly with the sophisticated font of Just a Note! I follow ME on Facebook,too! beautiful watercolor and love the colors. Beautiful card and I *need* that zipper die! Oh my gosh that is one stunning card! Beautiful! Wow, this is so beautiful, wish I could paint like that!!!! WOW ! Your card is really amazing ! I love your watercoloring and the colors you chose ! What a nice showcase ! Thanks for sharing. Really beautiful card. Thank you for sharing. So elegant and beautiful! Love this gorgeous card! such a beautiful card!! Love seeing all this inspiration along the stampede! GORGEOUS flowers! I want to learn how to watercolor like that. Maybe you could do a video! The watercoloured flowers are beautiful! Love this card! Just a Note is a perfect sentiment! So adorable too! Like on fb, follow on instagram/twitter ! I love the watercolor added to the card behind the sentiment. Beautiful! That's a very pretty card!! Beautiful card and I love the zipper die! This card is so lovely and that zipper die is terrific!